Who’s Bad: The Ultimate Michael Jackson Experience is an unrivaled celebration of pop music’s one true King. Join us as we pay tribute to the music legend on Friday, October 28, at 8 p.m. at the Wayne Theatre/Ross Performing Arts Center. Tickets are $30/$35 and go on sale for the public on Tuesday, July 26, 2016 at 10 a.m.
Who’s Bad’s live power-packed performance of Michael Jackson’s expansive catalog has ignited crowds on every continent and can only be described as a jaw-dropping, musical must-see. As the longest-running Michael Jackson tribute band, and the only one to predate his untimely passing, Who’s Bad has packed The House of Blues franchise all across the United States; rocked DC’s 930 Club and returned to their native Chapel Hill, NC boasting larger, more eagerly-awaited performances with every romp around the globe. Sold-out shows from Colorado’s Bluebird Theatre and LA’s Gibson Amphitheatre and Romania’s Sala Palatalui to Teatro do Bourbon Country (Porto Alegre, Brazil) tell the story: no corner of the earth is safe from this infectious party production. Who’s Bad has earned its name by paying studious attention to Michael Jackson’s every original groove and gravity-defying dance move, boasting over 100 years of professional experience. They’ve shared stages with the Queen of Soul, Aretha Franklin, The Backstreet Boys, The Four Tops, Boys II Men, and hip hop superstar, Pitbull. Whether you idolized the Jackson 5, fell in love to Human Nature, or learned to moonwalk to Billie Jean, Who’s Bad is THE ULTIMATE music-and-dance driven Michael Jackson homage. This band of professionals relentlessly elevate the legacy of pop music’s King, always pushing themselves to be more precise, to raise the level of excitement and awe, while embodying Michael Jackson’s mission to bring people together of all races, genders, and cultures through music. As the curtain opens on a Who’s Bad performance, every MJ fan feels the adrenaline, screams at the sight of that unmistakable silhouette, and succumbs to a surefire Michael Jackson sing-along. The energy is purely magnetic, the musicianship is first-rate, the dance moves deftly inspired. 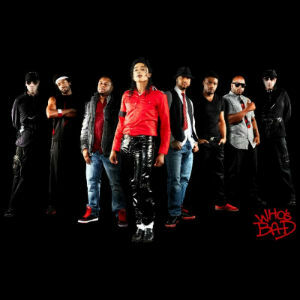 Who’s Bad is a tribute befitting a King and their high- octane execution of MJ’s music and dance has catapulted them to the exclusive rank of Ultimate!